Here comes the hard hitting third album from this San Diego based quintet, Cage. For those of you who followed the band in the past, you know that Cage plays traditional, Judas Priest inspired heavy metal. While this style is nothing new, Cage has successfully nailed it down to a tee. Simply, Darker Than Black is a lesson in what traditional heavy metal is all about: power, strong riffs, and melody. The album opens up with the instant classic, Kill The Devil. 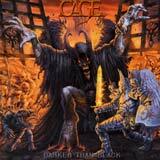 While this track is addictive with all its' Painkiller-esque power and melody, Cage are not satisfied just to be a very good Judas Priest clone. The album is well balanced between US style power metal tracks such as the opener and Blood of the Innocent and mid tempo (yet heavy) tracks such as March of the Cage and Chupacabra. Surprisingly, vocalist Sean Peck unleashes some black metal like vocals during portions of Chupacabra, White Magic, and Eyes of Obsidian. Such a vocal style fits the tone of the songs (keep in mind the album title here), although I personally prefer the traditional style delivery than Sean Peck employs with such character and enthusiasm. The riffs are forceful, yet catchy while the dueling guitars drive the songs to an even higher level of quality. I am also more than satisfied with the rhythm section as it provides a solid and well rounded backdrop for the sound. When a band ignores the importance of the bass guitar, I feel that the intensity of the album is dramatically reduced. There is nothing thin or lacking with the bass presence on Darker Than Black. In fact, the production is tight and all instruments are at the optimal level. Furthermore, the song structures are what you would expect from well seasoned veterans. There is enough variety throughout the album to keep things interesting and the quality level does not drop to "filler level" at any point. Fans of traditional heavy metal probably already know about this band. If so, you can blindly buy this album as it raises the bar set by the band's first two albums. However, if you've even owned a Judas Priest or Iron Maiden album in your life, and you're unfamiliar with Cage, it is time to discover this rising force in the world of traditional metal.